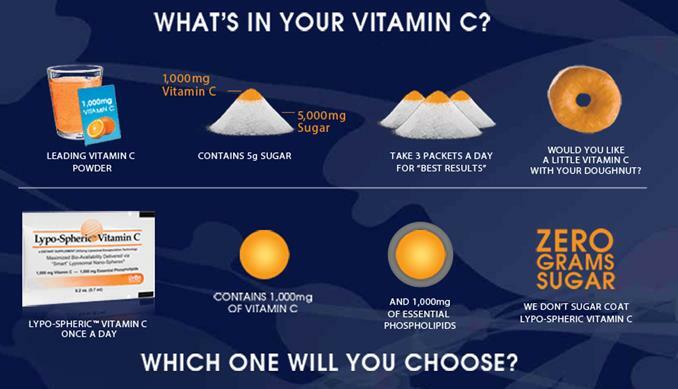 Recent clinical trials by world-renowned Vitamin C expert and pharmacologist, Steve Hickey, PhD, show that Lypo-SphericTM Vitamin C is able to produce serum levels of Vitamin C nearly double those thought theoretically possible with any oral form of Vitamin C.
Each 0.2 oz. 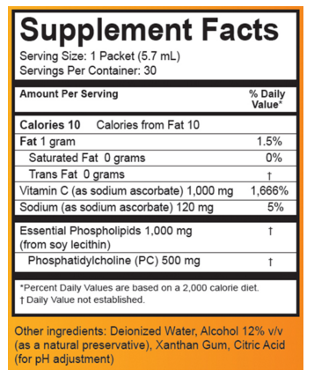 packet of Lypo-Spheric Vitamin C contains 1,000 mg of Vitamin C and 1,000 mg of "essential" phospholipids. It's the most bio-available, anti-aging, health-promoting, easy-to-swallow Vitamins. The phospholipids encapsulating the Vitamin C range in color from light orange to dark brown. As a dietary supplement take one to two packets per day for heart, liver, kidney, circulatory, glandular, and cellular health. For best results, snip or tear the notched end off the packet, squeeze into one or more ounces of your favorite cool beverage, drink on an empty stomach, and wait at least 15 minutes before eating. We do not recommend mixing the product with a hot beverage or with any high-speed blenders or food processors. When stored properly, the Lypo-SphericTM Vitamin C will stay 100% effective for a minimum of 12 months from the time of purchase. The expiration date is on the bottom of each carton and on each packet as "XMMYR". Note: It is not recommended to take any form of vitamin C with prescription Coumadin or Warfarin.